Keller's (Farfallina & Marcel) slim yet cheery tale introduces a fox with a knack for sniffing out missing things. Rose finds Meadow's lost dress-up lipstick (""It smells red""), Spike's new baseball and her mother's handkerchief, which ""smelled like Mama."" 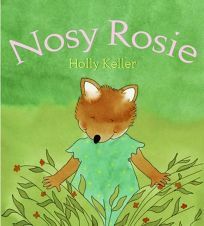 After a friend nicknames her ""Nosy Rosie,"" which she hates, and the name sticks, she decides to stop finding missing items. When asked for help, she stubbornly shouts, ""I don't hear you because that's not my name."" Taking a walk in the forest, she savors the smell of pine needles, and also picks up on another scent: powder and soap. She identifies the smell as that of her baby brother and follows her nose to a thorny bush, under which he is trapped. ""I was looking for you,"" the wee one endearingly announces. After Rose returns home with the baby, the other young foxes praise her. The successful seeker humbly thanks them, adding that she is ""just Rose, and that's the only name I want."" On a chipper note, the narrative concludes, ""And nobody ever called her anything else again."" Keller's sunny, brightly hued watercolor and black line illustrations energize the story and comically capture the young heroine's changeable emotions. Ages 4-up.